For my night in central Milan, I picked the Four Points, located near Milano Centrale. That’s not the message you want to see 4 hours before your international flight while it’s after business hours in Norway… One lengthy call to United (and some fingerpointing between United and Wideroe) later, I was able to check in and obtain a boarding pass. 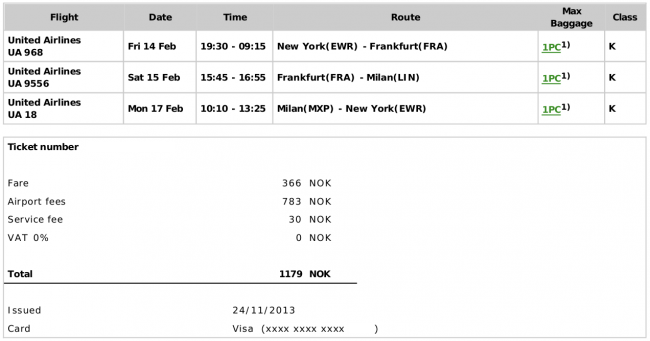 Back in November, a small Norwegian regional carrier, Wideroe, stopped charging fuel surcharges on Star Alliance-operated tickets across the Atlantic. Needless to say, the frequent flyer community pounced on the opportunity to save hundreds of dollars per round trip. While I had previously visited Milan in October (thanks in part to Emirates’ fifth-freedom route between New York and Milan driving down fares), I found it hard to resist a $189 round trip, all-inclusive fare. Originally, I had booked EWR-FRA-LIN/MXP-EWR, expecting to grin-and-bear two transatlantic flights in coach. Thanks to some weather waivers in the northeast during the days leading up to my trip, I switched over to the nonstop to Milan Malpensa, rather than take a long layover in Frankfurt. Having been escorted to a waiting car from the lounge, we quickly drove along the terminal past Lufthansa’s various widebodies waiting to depart to far-off lands. I found myself relaxing most of the night before my flight to New York. At about 1AM, I looked at my United reservation in dismay. My flight from Zurich to Frankfurt was there, as was my onward flight from New York. The Lufthansa First segment was missing in action. Fast forward an hour later and with the help of a United agent, I managed to get the segment restored. Nevertheless, it seemed prudent to head over to over to the airport a bit early. If everything was fine, I’d wind up enjoying more time in the First Class Terminal. If things weren’t, I’d have more lead time to resolve everything. After catching a few hours of sleep, I checked out of the Sheraton and walked along the arrivals level to the First Class Terminal. The main entrance to the building is on the second floor, with a driveway attached to it. The first floor entrance, accessible from the sidewalk from the arrivals level, has an elevator up to the check-in desks. I quickly checked-in with the agent and then passed through the most courteous security screening before entering the lounge. The lounge had a small display case filled with some of the collectible-edition, Lufthansa rubber ducks. Shortly into my meal, the check-in agent returned with my boarding pass, my passport, and a New Years edition rubber duck. Rather than list all of the day’s flights, the First Class Terminal’s departure screens are customized to the passengers actually in the lounge. The tables throughout the lounge had drink menus. I think those are fairly understandable. …but water? That seems a bit more far fetched. About 30 minutes before departure, I began packing up my laptop bag in anticipation of needing to depart. Around then, one of the lounge attendants found me and escorted me to the lower level so I could exit the Schengen Area and be driven over to my flight. United finally announced that they’re shifting to a revenue-based earning scheme for 2015. Given the announcement looks like a copy-and-paste (and a find-and-replace of “Delta” for “United”) from Delta’s announcements, it’s surprising it took them this long. We knew this was coming. Some are talking about the destruction of the program, but fortunately, credit card spending will save us. This change might finally spur me to get on the Delta bandwagon, though. At least with them, I can earn elite qualifying miles entirely from credit card spending with American Express. Since I had a morning flight out of Frankfurt Airport, I decided to stay at the Sheraton rather than try to stay in city center. While Germany has terrific trains to most (I’m looking at you, Tegel) of its airports, it’s hard to compete with taking an escalator and walking across a skybridge to the airport terminal building in the morning. I was given a king room on the 8th floor with a not particularly exhilarating of a view of the airport terminal. Having settled into my room, I ventured up to the club lounge. Late in the evening, most of the food options had been picked up, but a few deserts remained. After writing up my post about the AA award chart changes, I took a quick glance at Twitter. There’s not quite the sharp response that was elicited by United and Delta during their recent devaluations, but I caught notice of American Airlines promising that all would be revealed in the morning. US Airways has a new award chart out, increasing the price to 110k miles roundtrip for business class to North Asia. Somewhat oddly, first class remains at 120k miles roundtrip. MileSAAver Level 1: This looks like AA’s old off-peak awards. MileSAAver Level 2: These look like AA’s traditional peak MileSAAver awards. AAnytime Level 3: A very vague asterisk. It is meant to be announced tomorrow. AA did everything in their power to keep it hush hush until they sprang it on us. AAnytime awards will now be dynamic, meaning we will have to pay a premium on high demand dates/periods, and less on off peak periods. What is also unannounced as of yet is that International Gateway City Stopovers are also gone.